Happy New Year!! I have really dropped the blogging ball these past six months, but it's a new year, and I am recommitting to my blog duties. I have a super-fun giveaway for you today! I LOVE being a Purex Insider, since they allow me the opportunity to test new products, then share them with y'all, and give them away! 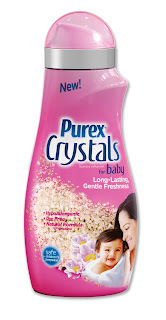 This month, I am reviewing their brand new Purex Crystals for Baby. I don't have a baby (mine are now 9 & 18! ), but I do have friends and readers with babies, right?! : ) So I applied to try these and got the box in the mail this week! I was surprised at how much I love the fresh fragrance of these new Purex Crystals for Baby. They have a soft, baby-inspired fragrance. And do they ever give your laundry long-lasting freshness! I haven't had it long enough to confirm their claim that it will last for weeks, but I can say that my freshly laundered towels & sheets still smell wonderful three days later. You simply add the Crystals to your laundry at the beginning of the wash cycle. Hypoallergenic & dye-free, they are safe for use on all clothes, including children's sleepwear. When you have a little one, it is so nice to have sweet, baby-smelling laundry! Purex Crystals for Baby is a wonderful baby fabric softener to use with baby detergent (including new Purex baby detergent!) that is made specifically for baby's sensitive skin. The Crystals work well in both top loader and high efficiency washers. I will definitely be using these for our laundry; the fragrance is just wonderful and I love not having to use dryer sheets! Crystal fabric softeners are my favorite new laundry product. Purex Crystals for Baby will be available in Walmart starting in early February. According to my coupons, the price will be about $6 per bottle. So, onto the giveaway! One lucky reader will win two coupons, each is good for a free bottle of Purex Crystals for Baby. Entry is via rafflecopter, so enter below! If you don't see the contest widget, click the link that says read more..... good luck! And the winner is..........Cassie B. !! Congrats, Cassie! I have! I use them in every load, the blue bottle is my fav! I want some!!!!!! I have babies! Lol. Love me some Purex! I haven't tried them yet, but I have heard that they are amazing! I commented on your How We Spent our November. Specifically I asked about the pickled cranberries...I'm really curious about them! I love them! Use them all the time. I'd love to give these a try as I have a newborn with sensitive skin. That free and clear junk works but doesn't smell good! No, I haven't tried them before.